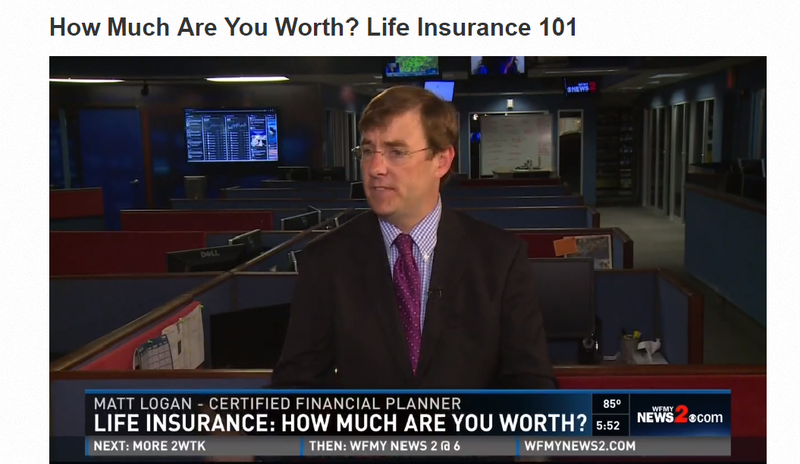 Click here for my most recent WMFY News 2 Interview about how much you are worth according to your life insurance. Who wants to talk about life insurance? Likely not many people you see on a daily basis. At least I hope so for your sake. Discussing mortality and what happens when you die is not very high on the list for a lot of people. One thing is for certain that all of us have in common is one day we will all die. Life insurance can help to plan for that day in a financial way to make sure your loved ones or financial obligations can be met. Today I wanted to look a little closer at the numbers to help viewers get some insight. Life insurance is a very important part of most people’s financial planning. It allows you to plan for many things that could happen at the time of your passing. If you have a young family, having coverage can provide you with a way to care for your family in the case of your unexpected death. Morbid, right? Well, you could also look at is as responsible. While we never plan to die while our children are young, unfortunately it does sometimes occur and having life insurance can help people with young families rest easy that their family would have funds to carry on if something happens. Other uses for life insurance can be to address tax issues with your estate, to care for others who rely on your income or to pay specific debts. There are many kinds of coverage and it can be used in many ways. Do You Currently Have Life Insurance Coverage? So you are sitting there wanting to turn off the TV to avoid thinking about your life insurance and your lingering questions in the back of your head? If you don’t have coverage, you will be happy to know that you are not alone. According to this recent survey, 42% of Americans do not have coverage. Don’t be too hard on yourself about it but I would recommend looking into coverage if you have none as it may be a financial need that you are missing. This is a tricky question. The truth is that in my opinion some people do not need coverage. Some people I meet with I believe are over insured, but for the most part people I meet with tend to be under insured. It is hard to come up with an amount of money to replace a person and many times the amount of insurance coverage people have is a nice big round number that sounds like a lot of money. One way I like to look at things is to look at your financial needs of your household and then review them in the case that your income ceased completely. Side note: stay at home moms, while not adding to the income monthly, definitely have a financial contribution and need for coverage. While I love my children dearly and think they are fantastic, the truth is they are a lot of work as well. If something were to happen to my wife who now handles the bulk of their needs during the work week, there would be a financial burden to go along with the emotional devastation. That financial burden would be having to be able to afford some sort of childcare so that I could still work. For those of you who work outside the home, I generally like to start with life insurance coverage that is at least 10 times your annual pay. This would allow for income for your loved ones for some time and not create an overwhelming financial burden for most families. Unfortunately, based on this chart showing the amount of coverage people reported having shows that many people just have a round number. A full 47% have less than $100,000 in coverage. While $100,000 is a lot of money, it likely would do very little to replace your income over more than a few years. Do I Need Coverage When I Get Older? As we get older, life insurance becomes more and more expensive. As you age, your likelihood of passing away grows. Some people think that as soon as they are no longer working, they do not need life coverage. This may be true for you or may not. It really depends on your situation as to whether that life insurance coverage is important in retirement. Do you receive a set pension that does not pass on to your spouse in full upon your death? You may very well still need life insurance coverage in that case. Do you have children who you would like to leave an amount of money to? Life insurance can be a great way to do that. Are there charities that you feel very strongly about? You could make them the beneficiary of your coverage. Unfortunately, the information below shows that many US Seniors do not keep their coverage and let it lapse. While each of their financial situations are different, I do find it shocking that a full 4 out of 10 US Seniors either let their coverage lapse or surrender coverage. Be sure to check on your coverage before you get to the point where you have to make this decision so you don’t have to drop coverage due to a surprise jump in costs. I recommend that people review their life insurance coverage every other year. Be sure that your coverage meets your needs and any changes in income, debt or family structure are reflected in your policies. You should also understand how your policy works, how long it lasts or is projected to last and whether or not the costs will increase in the future. Be sure to also check your beneficiaries of your coverage. If you have been through a divorce or had other changes in your family situation, you may very well need to update your beneficiaries and not even think of that. While life insurance sales have a terrible name many times, there are some great financial professionals in our area who can help you if you so reach out to someone for assistance if you are unsure.